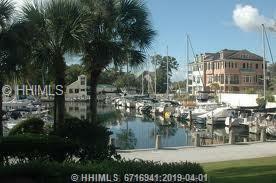 One of Hilton Head's premier Locked Harbours on the Intracoastal Waterway, at a constant depth of approximately 8ft. This marina is located on the north end of Hilton Head Island just south of Pinckney Island. 24-hour security, fueling, ship store & pump out facility. This 50ft boat-slip is 20ft wide, and located off the East Port Promenade in close proximity to the SC Yacht Club! Features include a concrete dock with protective wood sheathing on the finger pier face. There is a high rental demand for these slips! Listing provided courtesy of Charter One Realty - Office A. We do not attempt to independently verify the currency, completeness, accuracy or authenticity of the data contained herein. It may be subject to transcription and transmission errors. Accordingly, the data is provided on an “as is,” “as available” basis only and may not reflect all real estate activity in the market. ©2019 Multiple Listing Service of Hilton Head Island, Inc. All rights reserved. Certain information contained herein is derived from information which is the licensed property of, and copyrighted by, Multiple Listing Service of Hilton Head Island, Inc. Data last updated 2019-04-19T16:57:29.173.